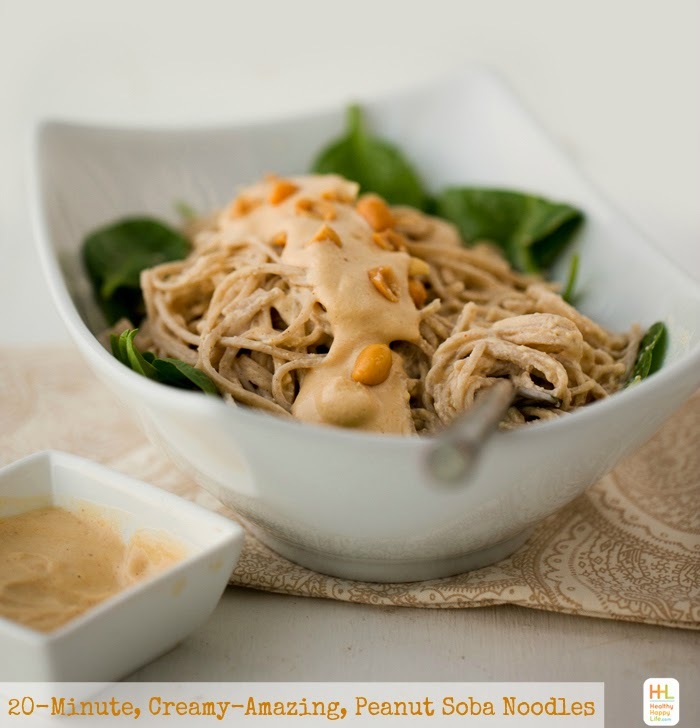 Creamy-Amazing Peanut Soba Noodles in 20 Minutes! My Creamy-Amazing Peanut Sauce Soba Noodles can happen in 20 Minutes. Dinner is done. This comfort food meal really saves the day in our house on busy weeknights. 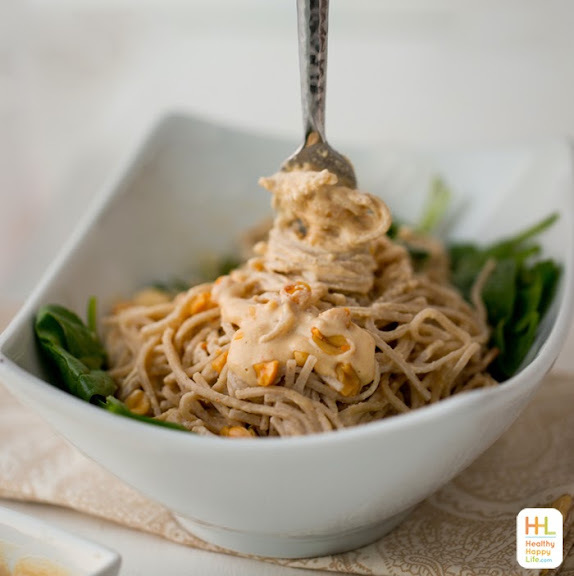 I whip up this sauce, toss it with some warm soba noodles and layer it with greens and sometimes tofu or tempeh triangles. Other ideas, you could also fold in some chickpeas or chopped veggies like raw carrots, roasted broccoli or carmelized onions to boost the nutrition and add some texture. Thank you for checking out my Festive Finds video and entering my Nespresso Giveaway! I love reading the comments about how winning would make your holiday easier! I wish I could give all of you guys a machine. If you haven't checked it out yet: do it here! Because this season I want our magic word to be EASY. Life is crazy enough, so food should be nothing more than a joy to prepare, eat and dream about. So I am trying to give you guys some easy recipes this fall and winter. And I am working on a mealplan for you too! A kickstart menu filled with easy ideas and inspiration. 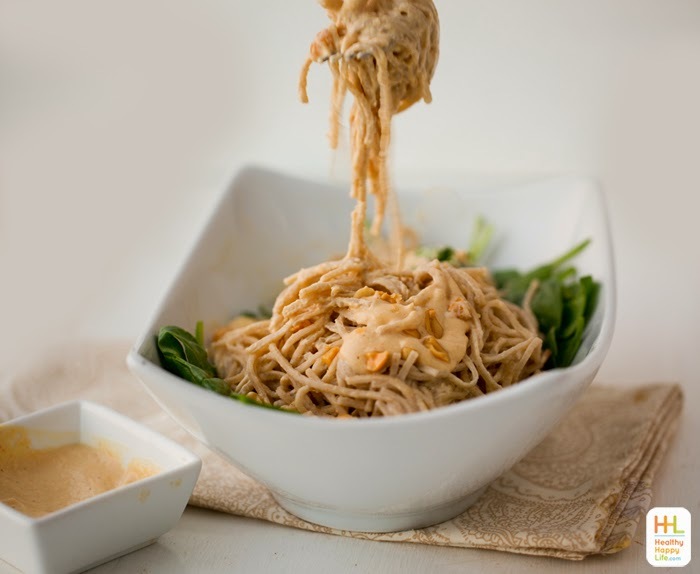 But first, this easy, cravable meal: peanut soba noodles. Yum-my. * To maximize all that buckwheat soba noodle goodness, look for 100% buckwheat noodles. Eden brand makes my favorite soba for 100% buckwheat. But there are plenty of buckwheat "blends" out there too. Most brands blend buckwheat with wheat flour. * Also, when cooking your soba noodles, stir them often so they do not stick. Soba cooks very quickly, especially the 100% buckwheat varieties. * I like to rinse my soba in cold water when draining. I find this removes some of the starch and "stick factor" when serving the noodles. * This recipe, like most soba recipes, is delicious served chilled or warm! Make ahead approved! Peanut Butter? Yes you could substitute the whole peanuts with peanut butter, about 1/3 cup. 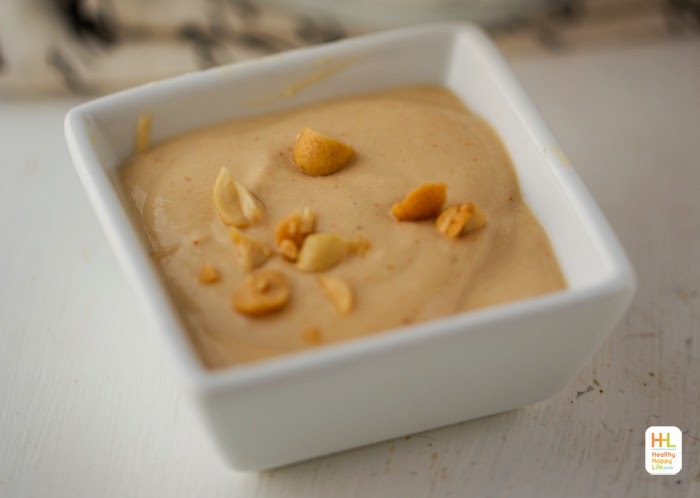 But really try to use the whole peanuts because the flavor is so much brighter and fresher from the freshly ground nuts! Tools: This recipe requires a high speed blender like a Vitamix, or a food processor might do the trick too. Use a small or narrow container blender size to maximize that fluffiness factor. 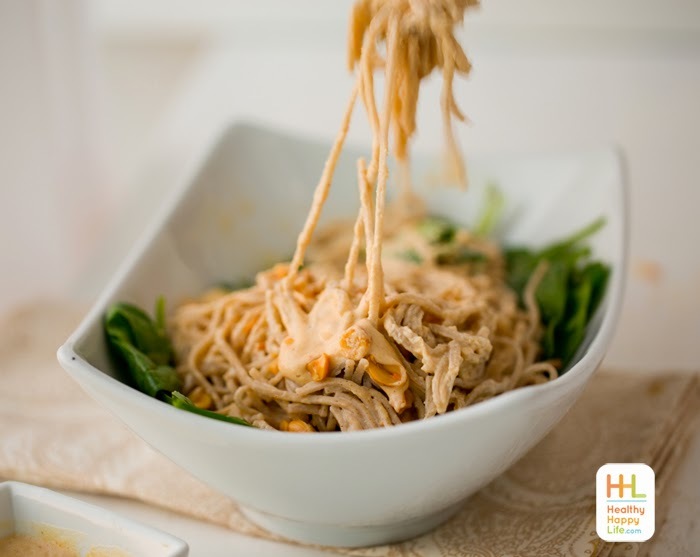 Easy as can be, this twenty- minute dinner idea is delicious and healthy. 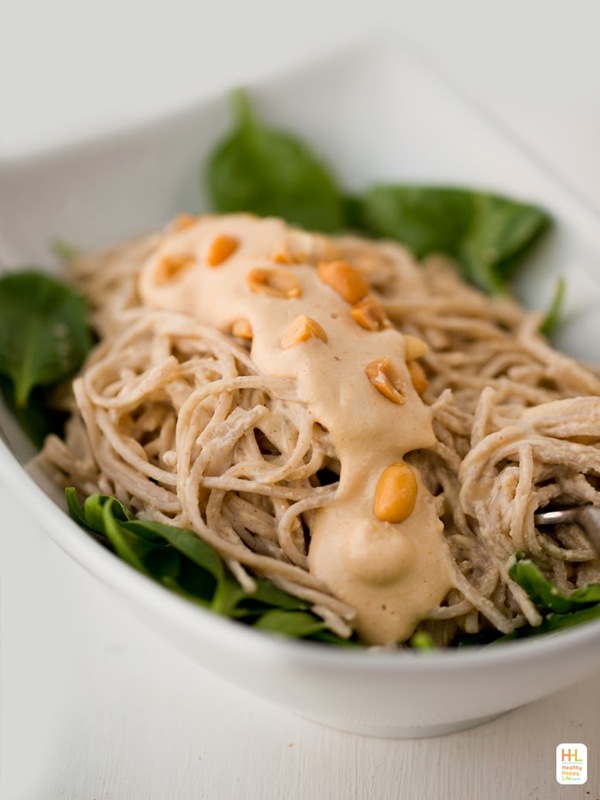 Buckwheat soba noodles mingle with creamy vegan peanut sauce. Bring a large pot of water to a boil. Add the soba noodles, reduce heat to medium, and cook until tender, usually about 5-8 minutes. 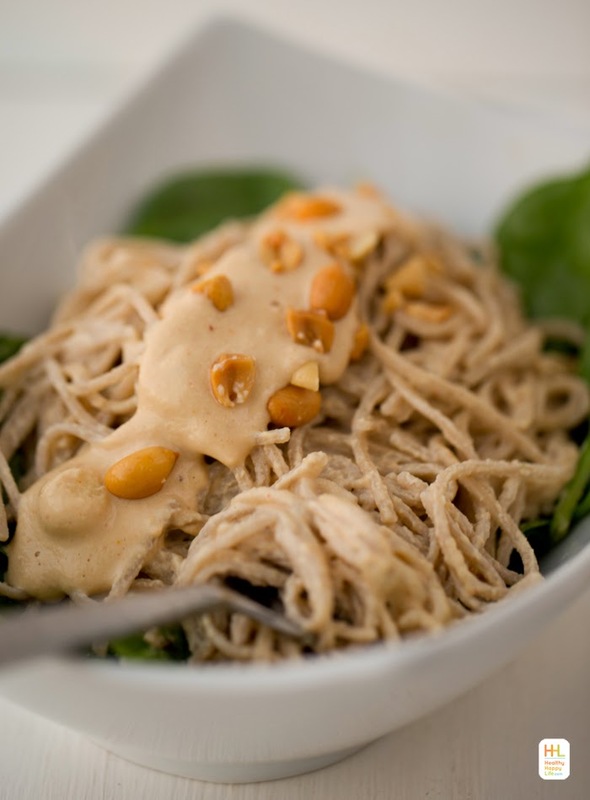 While the noodles are cooking, add all your ingredients to a blender like a Vitamix. Blend until creamy smooth. Tip: Use a narrower-style container to really whip some fluffy air into the sauce. Season with salt and pepper and cayenne to taste. Drain the pasta and rinse in cold water. Place pasta and sauce in a large bowl and toss well. 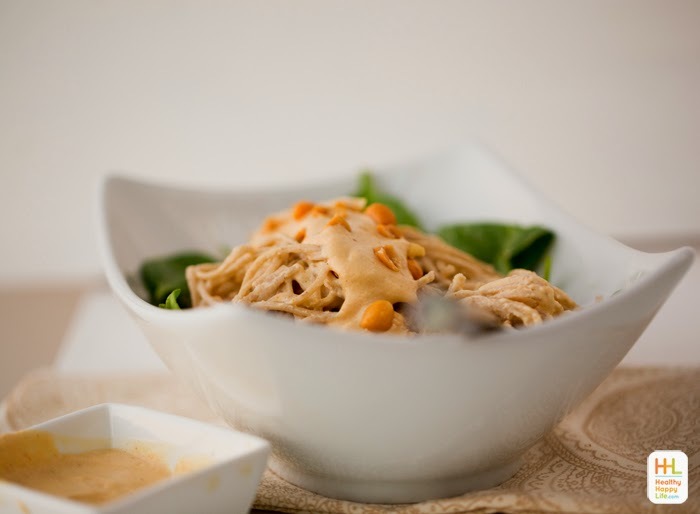 For lighter-sauced noodles, start out by only adding half the sauce and add more to taste or over top to serve. Serve over a bed of fresh greens, and a sprinkle of chopped peanuts on top.